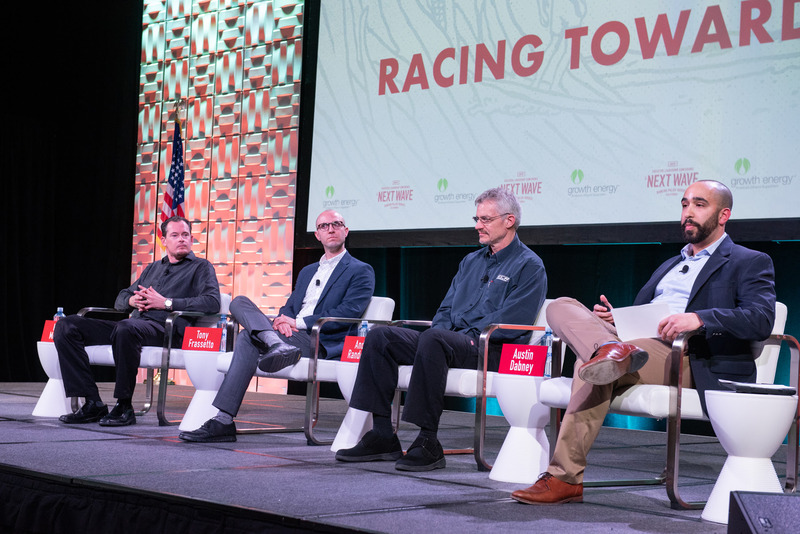 Left to right: Growth Energy VP of Market Development Mike O’Brien; Cumberland Farms Senior Vice President of Petroleum Supply and Operations David Masuret, and Casey’s General Store Director of Fuel Nathaniel Doddridge participate on the panel discussion, “A Surge of Retailer Growth”. Left to right: Trafigura Head of Ethanol Eric Fobes, ADM Director of International Government Relations Lorraine Hawley, U.S. Grains Council Director, Mexico Ryan LeGrand, and Growth Energy’s Senior Vice President of Global Markets Craig Willis look at potential ethanol markets across the globe. Left to right: Kyle Mohan Racing Owner Kyle Mohan, Universal Technical Institute Senior Account Manager of Business Alliances Tony Frasetto, RCR Engines Technical Director Dr. Andy Randolph, and Growth Energy Senior Communications Manager Austin Dabney discuss how ethanol is the top performing fuel for engines.